Julie Gard: "Bright Green Olivine"
These are grains of sand from a beach in Hawaii at 110x magnification. I find this hard to believe but want to, and now I long to see every plant, mineral, and household object - or sliver of it - under a microscope. There are small worlds inside of the large world, composing it, making it up. 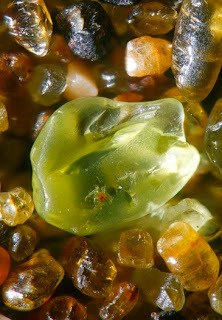 Image and post title credit: Gary Greenberg (photos) and Lizzie Buchen (text), "Each Grain of Sand a Tiny Work of Art." Discover Magazine, 5/1/08.